Seem to be a really nice bike so far, but one thing i need to change are the bars, the ones that came on the bike are really narrow ( size 52 ) and Ive got really wide shoulders. Ive considered trekking bars and flat bars but for now i think I'm going to stick with drop bars, any recommendation for a wide bars? and is there a reason they use 26mm bars over 31.8s ? thank for any help. here are a few pics all stock and uncut. Congrats on the new bike! Did you mean 52 or 42 cm. on the handlebars? Take a look at Salsa Cowbell 3. They are super comfortable on all positions and at a good price. Bikes: Aegis Aro Svelte, Surly LHT, Cannondal R3000 tandem, Santana Triplet. I like it! How do you like the seat that comes stock on it? I replaced mine with a Brooks flyer. The Salsa Cowbell 3 looks nice. Salsa finally got the compact/elliptical bend message. FWIW, I love this design. FSA was there earlier with the Omega (round top) and Wing and Wing Pro series. From what I see, all of those are 31.8mm diameter only, which makes some sense with modern stems. However, some of us still run 26.0mm dia quill stems, and apparently that is what your new rig came with. In that case, try to find some Soma Highway 1's. About the only compact elliptical radius bar I've seen in 26.0mm clamp, with a silver option to boot. Not to pricey and they even have a 44cm, which is my preferred width. you may also want to find a small set of clip on "Aero" bars for a couple extra grip points. I a friend that uses them and seems to really like them. Never used them myself though. Thanks for the pics RickD. I might get a 52cm DT (frameset) too, although I'd like a 700c version and the 56cm is just a little too big for me. It's nice to have pics of your desired size to study. 31.8mm gained popularity several years ago, first in mtbs IIRC, and now more than half the stems and bars are 31.8. The larger diameter makes the bar and stem stiffer and stronger, at about the same weight as their 26.0 counterparts. However, I am not aware of there ever being much of an issue with stiffness/strength with 26.0. I think this was simply a marketing-driven change - something to sell your bike over your competitors with a "puny old" 26.0. It's not a bad change, it's more or a solution without a real problem - some bored engineers fixed something that wasn't really broken. Get whatever you like, it really doesn't matter and the prices are nearly the same. 26.0 is more than adequate for the great majority of road bicyclists (and mtbers too). Here's how you can find a wider bar - go to link below, select desired bar width, click search. Bear in mind some mfg's bars are measured center-to-center, some aren't and some are not indicated at all so you have to research the mfg's website, or dealers' product descriptions. Pay attention to bar reach and drop, as it will affect fit and comfort as much (or more) than bar width. This search will provide a list of all QBP distributed drop bars that are currently in stock and available for immediate purchase. The database is updated frequently. Any QBP affiliated LBS or etailer can order the bars for you. AEBike is pretty price competitive, and I've bought from them many times over the past decade. However, I use this link on forums because AEBike uses the best shopping cart software (with the linked search feature). Last edited by seeker333; 04-19-12 at 10:09 PM. I was not sure of the 26" wheels either, but they ride good and look good, i haven't tried yet but i think 700c will fit in this frame rear triangle and fork looks to be the same size, i have a set of 29r wheels I'm going to see if they fit. I've considered the same thing, 700c on a 52cm Disc Trucker. I have 26x2.0" tires on my LHT, and these wheels (with tires) have an outside diameter of ~66 cm. I have full fenders and there is ~2cm or more of space for larger diameter wheel+tire. My road bike has 700x23 wheels with a diameter of ~67cm. I estimate it should be possible to fit a 700x28 wheel/tire into a 26" frame DT with fenders, and perhaps as much as 700x32mm. 700x37mm may fit if you go fenderless. Raising the bike 1cm from 2cm taller wheels will add some trail, and make the steering slower. And raise the center of gravity. If you try those 29er wheels, please let me know what you learned. Last edited by seeker333; 04-20-12 at 01:24 AM. Can I ask about how much you paid for it? In theory, 31.8mm bars are supposed to be stiffer than 26mm bars. 26mm bars and stems may be more common, however. My favorite bars are 3T's Ergosum and Ergonova. They're only available in 31.8mm, so that's what I use. Nice looking bike, BTW! the bike, shipping and tax was $1400 even, well woth it i think , and as a side not the drive train on this bike is smoother than my cannondale, really nice. I have a Cowbell bar and like it a lot but what I don't like is that it only comes in 31.8 which cuts into the real estate available for a computer, light etc... The Soma Hwy 1 also looks like a great bar and I would have probably purchased it but it doesn't come in a 46 and I need a wide bar as well. If the reach and rise of you stem are good, I would find a bar that will fit rather than replace the both. Nice bike. I have WTB Dirt Drops on my trucker, they are great bars...especially for riding on /behind the hoods. I also run a Salsa Woodchipper on my SS monstercross setup. I really love those bars, great for climbing leverage and riding in the drops. Neither bar has a deep drop but I find that to be pretty spot on for the more upright position of my bikes. i haven't tried yet but i think 700c will fit in this frame rear triangle and fork looks to be the same size, i have a set of 29r wheels I'm going to see if they fit. Did you have any luck fitting a 700c wheel into your 52cm DT? +1 on the Nitto Noodle. I have a history of hand numbness and the Noodle saved me. I like it so much I have three of them, and I think I'll have a Noodle on every road bike I ever own. Ok i had time today to play with the 700c wheels, my 29er wheels with 2.2 tires will not fit but after doing some measuring 32-35 should fit fine and unless you've got really big feet toe overlap should not be a problem. The 700c did raise my stand over to somewhat of an uncomfortable level , doable but i wouldn't want to slip of the pedals. I did go ahead and order the Salsa cowbell 3 and a new stem, hopefully I'll get them this week. Last edited by RickD; 04-22-12 at 01:36 PM. Thanks for the info RickD. I bought the frameset a few weks back, but only started building last week. I love the rear dropout! Stripped down my Sutra and started building the Trucker up yesterday. So far so good. Still waiting on some parts in the mail. Bikes: Cheap K-Mart Mountain Bike. On the path to upgrading. I just ordered one on Saturday. It is suppose to be in tomorrow. Tomorrow can't get here fast enough. This will be my first venture on a real commuting/touring bike. 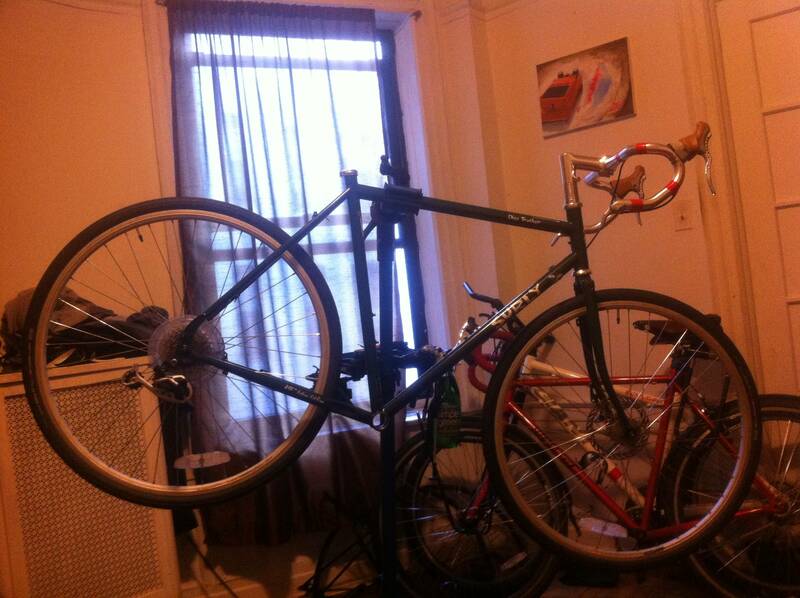 I'll be transitioning from a Fuji Absolute turned into a commuter bike. Looking forward the the new experience.